Well friends, I am in danger of not meeting my expectation that I set out only five short posts ago. I blame my husband (because, why wouldn’t I?) and assume absolutely no fault of my own. I am so close to not making a post this week. Seriously though, it’s been a crazy two weeks. Yeah, I said two weeks because that last post I made was from the archives of “Crap I wrote Forever Ago”. You know, from the annals of “Lauren, 2014”. So, it was old. Much of what has happened over the past two weeks has been the same as it always is, but topped off with a teething toddler, a blizzard, the overwhelming desire to both drink ALL THE THINGS and never drink again, writing a bunch of stuff that I hated, and several Powerball losses. Let us begin with the writing of things that I hated. Really, I didn’t so much hate them as I was unsure of them. I asked the husband to read one of them and after giving me some constructive criticism (that I asked for), I decided that I hated both him and the story and scrapped them both. Just kidding, you can’t scrap a husband. Well, you can scrap a husband, but it’s frowned upon. Then I decided that maybe what I really needed to do was stop writing things that nobody (Hi mom! You’re not Nobody!!!) was reading, so I decided to go public with this next month. Because THAT was the missing element to making writing easier. The teething toddler is self-explanatory. She’s teething, it’s awful for everyone (but probably way more so for her), and she’s a toddler which means she can’t tell me that she’s throwing everything I own across the room because her face hurts. This may be the first blizzard ever where I was totally stressed out beforehand. Usually I would have just purchased all the beer and cigarettes that my house could hold and then battened down the hatches and rode it out. Since this our first major snow storm as parents (and we live directly on top of a Hellmouth, where we used to lose power if it was a partly cloudy day), I was terrified. I thought for sure we would lose power and have to trek out in the middle of the blizzard to one of our parent’s houses, teething toddler in tow. Thankfully, none of that happened. We did get some damn near record breaking snow though. That was pretty cool to look at. I think wanting to drink-all-the-things/never-drink-again is pretty self-explanatory (“at least it should be” she thinks as she slurps wine from her fish bowl sized glass). 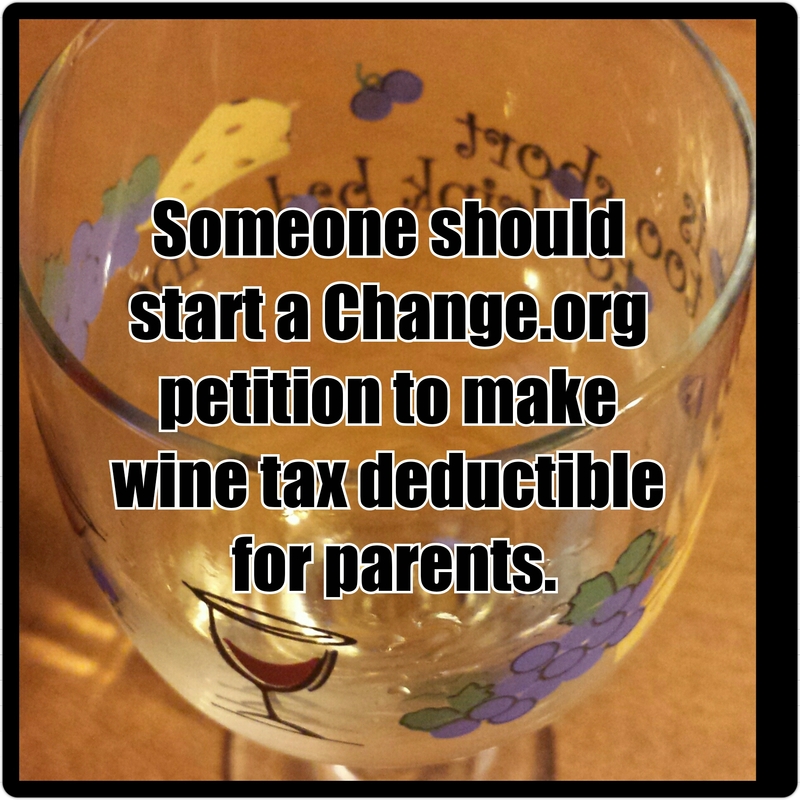 Also, someone should start a Change.org petition to make wine tax deductible for parents. And now, let’s talk about the Powerball. I totally get it. I have a better chance of finding an actual leprechaun in my Lucky Charms tomorrow than I do in winning the Powerball. I really do get it. I promise that I do. But every time I don’t win the lottery, a piece of me dies. I would make such an excellent lottery winner. I would be good for the local economy. Paying off my mortgage and making vast improvements upon my homestead. I would totally be good for the storm ravaged Jersey coast too, because I would be buying a shore house as one of my top five first purchases. Even our family would reap some rewards. We wouldn’t be selfish. Also, we would invest the crap out of it. I already know how we would break it up and where our funds would go (depending, of course, on how much we win)… I’m going to buy an excessive amount of PP&L stock, diversify my portfolio with mutual funds, get my hands on some of that IRA action… annnnnnnnnd… I just realized that our entire retirement plan is based on us winning the lottery. Maybe my grip on the reality of being a lottery winner is a bit more tenuous than I had thought. And I do believe that concludes my excuses for slacking over the past two weeks. Hey, not all my posts are going to be winners. Some of them are going to just be me writing just to write. I hope you’re into that sort of thing!